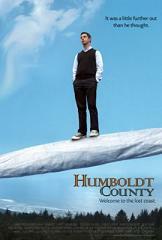 The movie "Humboldt County" was never intended to be a big hollywood production. It is not a blockbuster with major stars and special effects, but about life and humanity and fittingly the soundtrack is best described as "intimate". Rather than a big orchestra we hear just a handful of instruments, and the acoustic guitar on the opening track "The Exam" adds to the homely feeling. While this is rounded out with a piano, a bass and then a cello, it never stays far from the home-made feel with the microphone picking up lots of finger and fret sounds. The "Humboldt County Theme" is a more upbeat instrumental song adding a fuller string sound but retaining an air of melancholy. "Green Corridor (Main Title)" again starts on acoustic guitar before a drum kit brings in a simple rock beat. The guitarist in these opening tracks is also the composer iZLER who has a long association with the instrument, accompanying many well-known singers such as Robbie Williams. Though primarily an original soundtrack, the album contains a few song tracks carefully chosen by Music Supervisor Peymon Maskan, who recently launched "Little Mountain" a new record label purely to release the soundtracks from his recent independent films, "Humboldt County" and "Dance of the Dead". Among the song tracks are the jazz number "I Want You To Be My Baby" performed in the movie itself by Fairuza Balk, and one of the longest songs is Earlimart's "Happy Alone". Frances Conroy (of 6 Feet Under) also sings on camera in a husky Marlene Dietrich voice with "No Other Love But You" accompanied by a piano and a child's voice. iZLER's underscore heads off in some unexpected directions, first with the weird and windy "Event Horizon" and then with "The Party" which is a minimalist percussion track with a Latin vibe which comes to a screeching halt, before returning to the acoustic guitar soundscape with "The Woods". Radical Face keeps the guitar for the song "Welcome Home" and is joined at intervals by some equally unusual hand-clapping rhythms. The film is about a small remnant of hippy culture discovered in modern day California (giving rise to the tag-line "Were the Grass is Greener"), and this track feels as though it belongs to that era. "Rosie's Speech" is led by a reverberant piano with the guitars tucked neatly into the background. "Feds" starts with some electronics sound-effects like a dream sequence, and veers off at some strange tangents before waking up to the comfort of iZLER's guitar. Junip brings us the song "Turn to the Assassin" and the album ends with 3 tracks by iZLER, the final track "Never Better" being penned by the composer before he was hired for the job! On the strength of this soundtrack, the composer was invited to the Sundance Composers Lab in 2008. More about the movie including the trailer can be found at the movie website http://www.humboldtcountymovie.com/, where you can also purchase the soundtrack album via iTunes.